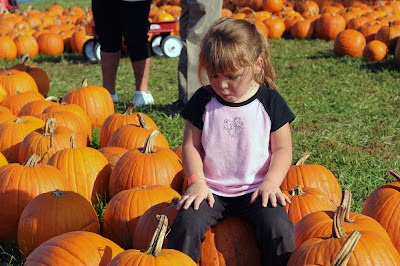 We made our annual trek to the pumpkin patch a few weeks ago. Except we boycotted the place we’ve gone to for the past five years. 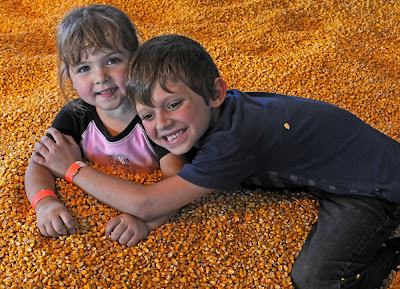 After laying out an average of $100.00 (not including food or pumpkins) at this overcrowded, pay with a pint of A Positive, overly priced pumpkin patch we decided to go here. The kids had a blast and instead getting nickeled and dimed to death, everything was included. This is the part of the post where I share pictures of my grandkids. Leave now or forever hold your peace. Here they are doing the fake smile so they can move on and have fun picture. There was a wicked 100’ X 200’ air pillow you could jump on. I so wanted to partake of this bit-o-fun, but my bladder thought better of it. 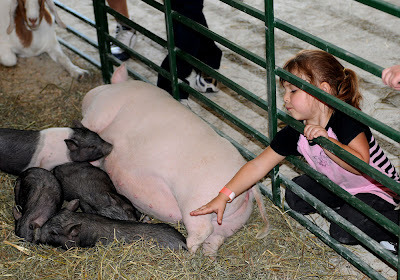 The petting zoo, thank God, wasn’t like the other place where you could feed them. The animals at the other place were so overfed I’m surprised PETA hadn’t stepped in. Seriously, their animals had stomachs stretched like a balloon ready to pop (squeeeek, squeeeeek, BLAM!). Now some people might think that would totally be in keeping with the Halloween spirit. Just visualize the innocent children with handfuls of sliced carrots and pellets dispensed from gumball-like boxes being splattered with blood and intestines as one of the cute little goats explode. I’m sorry, I digress. Oh Wait! I’m even sorrier that I used that word. Somehow it always rubs me the wrong way when bloggers use the word ‘digress’. I don’t know why, it’s just like fingernails on a chalkboard to me. Anyhoo, here are some little piglets being fed au natural. 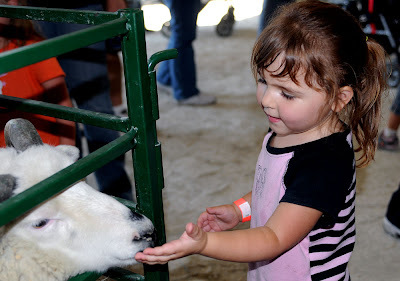 And a cute sheep…with my cute granddaughter. Wait. What the hell is this thing? Of course there were pumpkins. Wait. She can’t decide which one she wants. Decisions. Decisions. 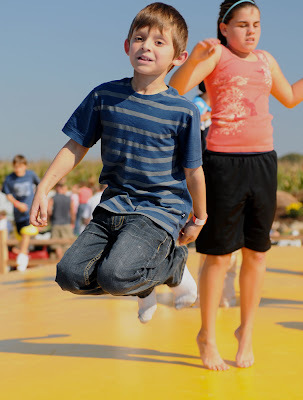 Beside the corn maze, hay and train rides, duck races and tricycle races. There was this. This! I Love It. 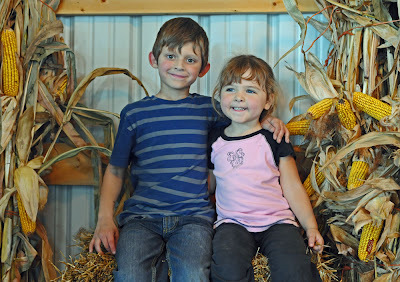 Grandchildren of the Corn. Very good times had by all. Thos ewere some very contented animals at the petting zoo. A very happy pair of young people! 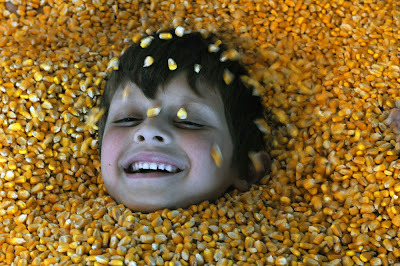 Those are some SUPER cute pictures~ Especially the ones in the corn.. 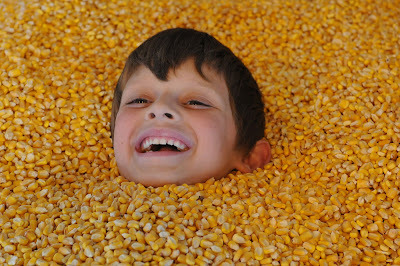 I'm glad you made the "Children Of The Corn" reference... It's a perfect one to use. Oh that looks like a great fun filled day!!! Makes me jealous. I might have to drive over and see my grandkids tonight!!! Tell them to be careful and safe from me ok? oh my goodness. These photos are fabulous. They certainly are adorable! Cool. 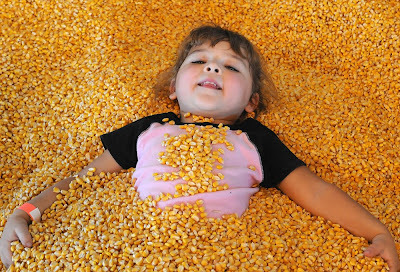 Grandchildren of the corn. That's funny. 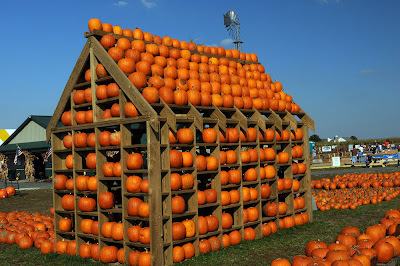 I love the pumpkin house. I've never seen one like that before. Your grandchildren really are adorable. What a lot of fun they had! Cute kids, for sure! That place looked amazing, and you say it wasn't that expensive - NICE. I always hate when they let hundreds of people a day feed the animals. It just never seemed right to me either. 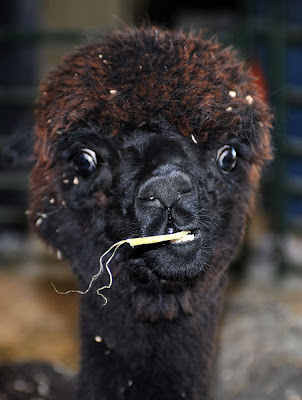 Llamas are just about the strangest animals. They've got weird hair and strange habits. Just for grins, they were given the disposition of a teenaged human. I went to a Halloween festival thingy and they charged 3 dollars a ride and that included ONE TIME down a slide ONE TIME. WTF?!!! That's cute. There's a place like that around where I live, but it's not quite as elaborate. The kids love that stuff.